Status: Partially identified – the young woman at right is Ellen Gold. Blog post by JMM intern Ash Turner. To read more posts from JMM interns, past and present, click here. 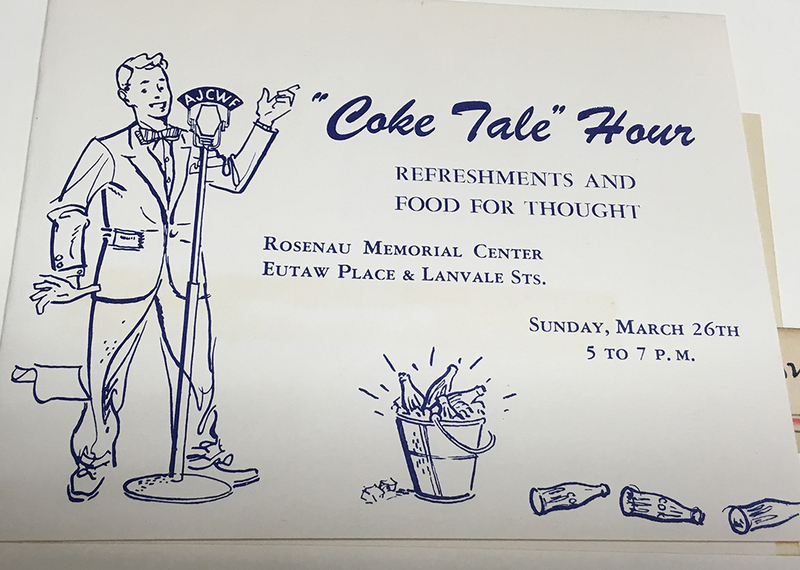 While looking through material from the Associated Jewish Charities and Jewish Welfare Fund from the 1940s to the 1970s, I have found a treasure trove of fun illustrations. Everything from invitations, to informational booklets, to newsletters contain small drawings that are simple and expressive. 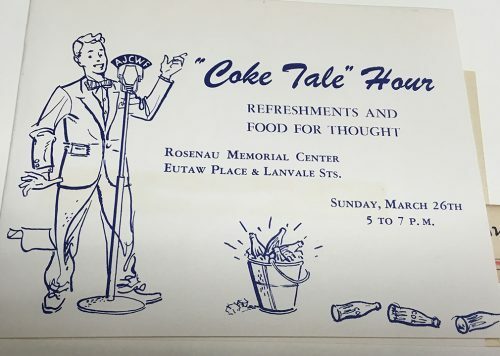 My time researching the Associated was made even more fun with the addition of these little gems sprinkled throughout their fundraising material. What I really wanted to talk about were the artists who made these great illustrations. But as far as I can tell, there is no documentation on who drew them. 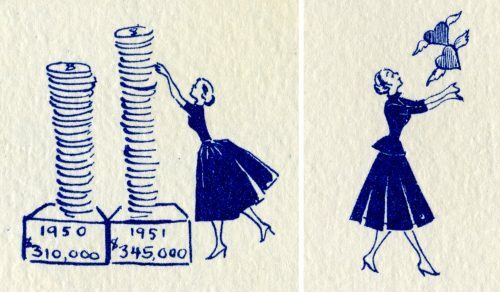 What I do know is that many of these drawings are found mostly in the Women’s Division scrapbooks and within their campaign material (the Women’s Division was a formal organization of women within the Associated that volunteered and ran fundraising campaigns from 1957 to 1993). 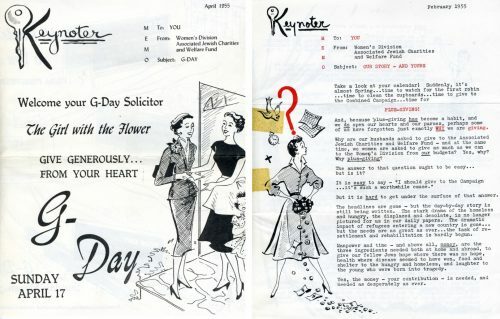 Since there is also no clear record of a position or job of “artist” or “illustrator” early on in the Women’s Division or the Associated, and since there is no clear record of someone being hired to create these illustrations, there is a possibility that these artists were simply volunteers, specifically women from the Women’s Division. 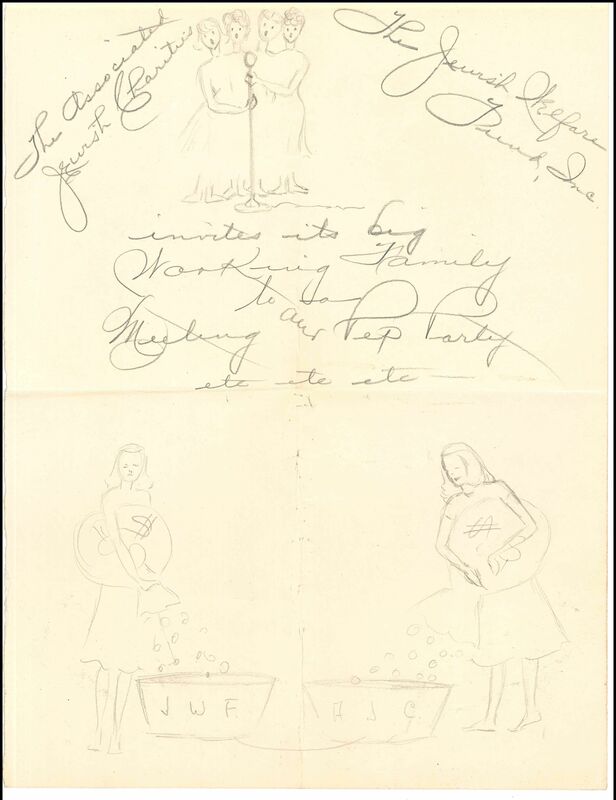 The sketch below, most likely created by a volunteer, supports the feasibility that volunteers created their own illustrations and material for Women’s Division events. But, since this is just speculation, and I don’t have specific information about the artists who created these drawings, I will just focus on talking about the drawings themselves, and how they relate to the women of the Associated. 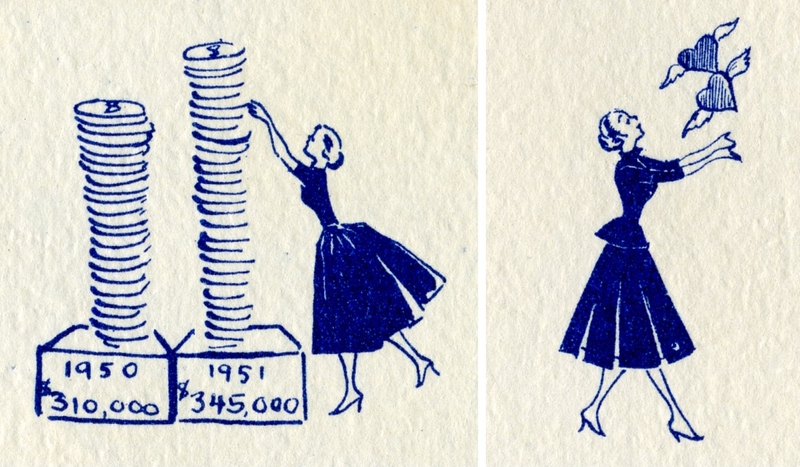 Many of these Women’s Division illustrations from the late 1940s through the early 1960s are sketched, simple line drawings, usually added next to text on invitations and fundraising cards. Most look like quick sketches, as if they were hand-drawn and then reprinted, and they can be found in the Division’s newsletters and other advertising materials. A few of the drawings contain simple and clean lines with a single accent color, pulled together in a thoughtful layout. They mostly depict women at work—volunteering, fundraising, or deep in thought. 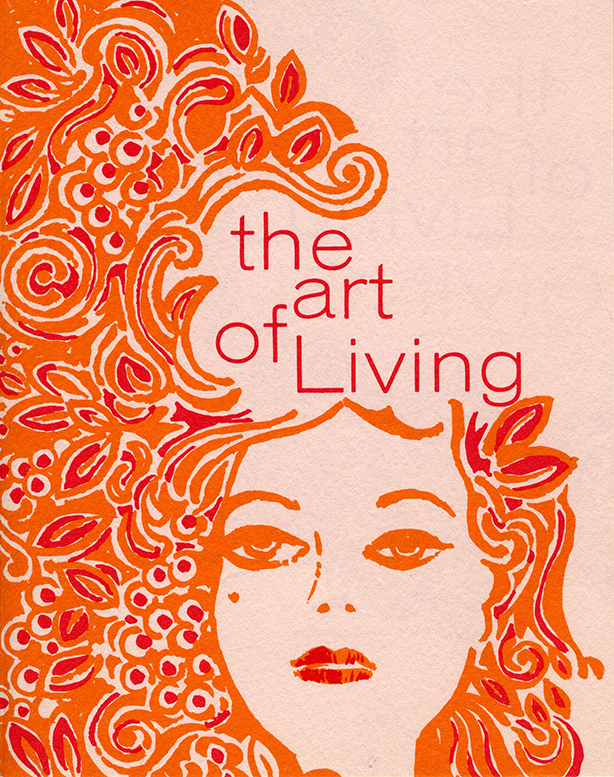 In the late 1960s and onwards, the illustrations start to become more fleshed out. These drawings have cleaner designs, and sometimes are either cartoonishly stylized or realistically rendered. This is the time period when the Associated’s illustrations become integrated into the overall graphic design of the campaign material as well, making the drawings feel more professional. To me, these illustrations make the regular campaign material more inviting and approachable. 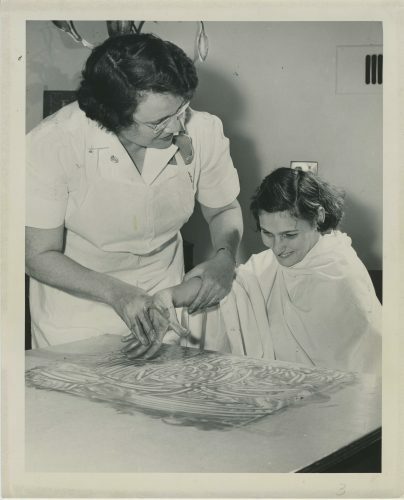 They depict the role of women in the Associated, and how they viewed themselves at that point in time: heavily engaged and committed to social work, a part of the community, and lending a helping hand at every turn. The way the women are drawn in the illustrations—proud, emotive, active… It’s not a stretch to say that they are drawn more often than men in these illustrations, and it shows how big of a part they played in the Associated’s organization and their fundraising campaigns. Women in the Associated were very engaged with both the arts and culture, especially during this time period from the 40s to the 70s. They were a part of the Baltimore art community, hosting art exhibits and teaching art at the Jewish Community Center. They held art and cultural festivals, such as the “Village Fair” hosted by the Ladies’ Auxiliary of Levindale. 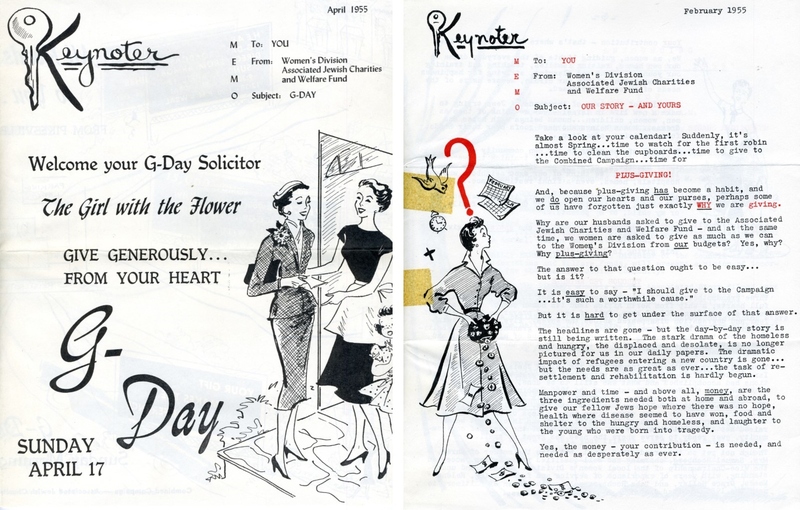 The Women’s Division wrote and performed their own plays for their campaigns and wrote original poems to include in their newsletters. Regardless of if they drew these illustrations for the Women’s Division, the women of the Associated took an artistic approach to connecting with their community, and I feel that their work in the arts is communicated through the illustrative touches added to their campaign material. They went above and beyond to engage and connect, combining art with fundraising to create these magical moments and drawings that livened up their campaigns. A blog post by JMM’s Director of Development, Tracey E. Dorfmann. To read more posts from Tracey, click here. I am grateful to be the mother of a talented children’s illustrator. Among the many things I have learned from my daughter is to consider children’s illustration as a high form of art. There were many wonderful picture books that my daughter Hannah and I shared together when she was little. Now I look at these books and their illustrators in a different way and see how they fit into the pantheon of children’s publishing. 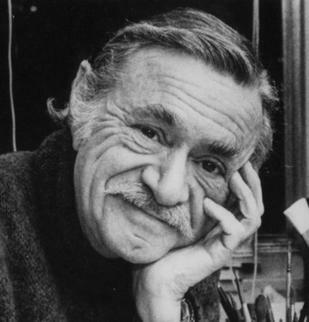 As the adage goes “a picture is worth a thousand words.” This is certainly true for the American writer-illustrator, Ezra Jack Keats. The child of Jewish immigrants, Jacob (Jack) Ezra Katz was born March 11, 1916. He grew up in the “East NY” which was the Jewish Quarter of Brooklyn. As an early 20th-century Jewish child Keats grew up in harsh and impoverished circumstances in an era of great anti-Semitism. In interviews, he recalls “feeling invisible” as a child. His gift of artistic expression became his coping mechanism in his rough and dreary neighborhood. Always a prolific artist, he painted and drew on any surface, that he could. He was also known to have a modest and caring temperament. 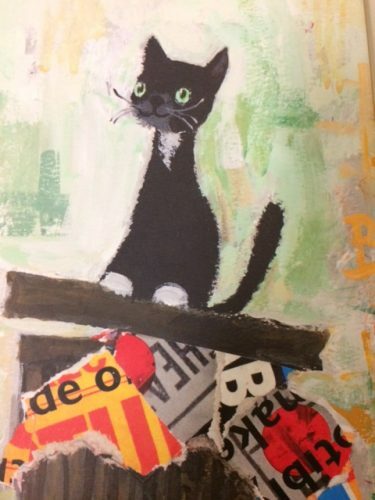 The experience of making images on so many different kinds of surfaces may be how he came to back collage techniques later in his artistic life. It was the first picture book to depict a black child as the main character of a story. The tale focuses on the enchanting aspects of a snowy urban neighborhood rather the color of the child’s skin. Yet for so many children this was the first time they could see themselves depicted in a storybook. Though Keats never had children of his own, there are millions of children around the world who claim him as their own. 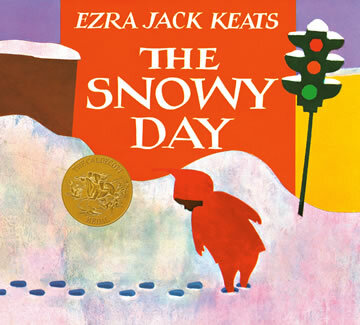 If you are interested in finding out more about this wonderful illustrator there are many books about his art and his life or enjoy this YouTube video from a 2012 exhibition of his work presented by the Jewish Museum in NY and check out this Ezra Keats website.